Saint-Gobain PAM UK, leading ductile-iron solutions manufacturerhas launched its new Ensign rodding branch. Designed in collaboration with plumbing installers, the rodding branch combines up to eight components into one fitting to simplify and save on installation time. After working alongside installers, Saint-Gobain PAM recognised that an opportunity to significantly reduce installation time was identified when installing horizontal pipework. This was particularly apparent in multi-storey developments with basement levels where the drainage systems can have numerous directional changes and multiple connections to vertical pipe stacks. Typically, this type of application would require several components to be assembled together; now with the new Ensign rodding branch, the installation time of each directional change is reduced by at least 60%. 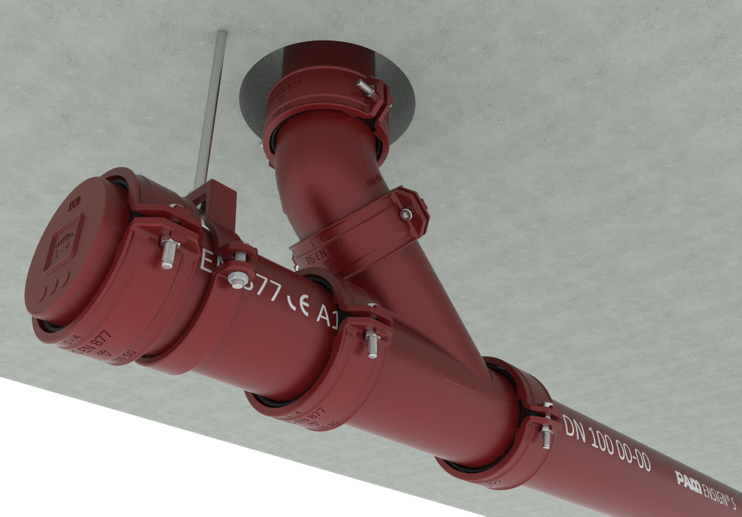 Mike Rawlings, Marketing Manager for Saint-Gobain PAM, commented: “This is the first outcome of our new underlying strategy that aims to provide added value to cast iron drainage solutions for installers. It was vital that we listened and understood the challenges they face in order to create better solutions that would save them time and money. Essentially, the Ensign Rodding Branch- delivers best practice installation more quickly and simply for installers. The new branch is available in a 45° angle for horizontal directional change and 90° angle for use where the vertical pipe stack connects to the horizontal pipe run. The product combines all of the components into a single part, which also includes a pressure resistant end cap tested up to 5-bar of static pressure and a fixing lug. These additions remove the need for the grip collar and the full bracket that is required when creating a directional change in the traditional manner.